When choosing a landscape design company in Newton, Massachusetts, you want to choose someone you can call for all of your landscaping needs. Ivy Studio consists of a highly-qualified team of designers and builders who take pride in creating gorgeous luxury landscapes. We do full-service landscape designing, building, and installing whether you are looking for a beautiful retaining wall design, outdoor kitchen, or natural boulderscaping, we do it all with care and attention to detail. 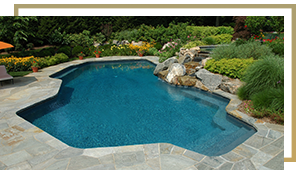 As your premier pool builders and designers in Massachusetts, we serve a wide area around Boston. 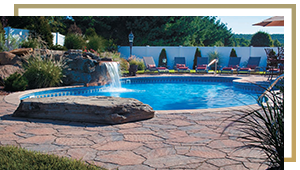 By offering custom swimming pool design services in Newton and Middlesex County, we are able to help homeowners achieve the backyard they have always dreamed of. Keep reading to learn more about custom swimming pool design in Newton, or head over to our consultation page to learn more about our other service areas. Zoning Regulations: Even though you are building a pool on your own property, you still need to comply with local zoning regulations and may need a building permit, depending on your exact location. For example, some municipalities require pools to be fenced in or require a certain portion of your yard to be sloped in one way or another to dictate runoff. Additionally, gas and sewer lines that may be located in the area you want your pool may need to be relocated, which can incur additional steps in the process. As your experienced pool builders, we deal with this all the time and would be more than happy to help walk you through the process and submit necessary documents to ensure the project is all above-board. it’s 80-degrees out, installing a pool can take some time and it would be best to have it ready to go before the hot weather kicks in for your own enjoyment. If you wait until summer to start your project you may spend the warmest months of the year staring at a construction crew in your backyard instead of staring at your kids joyfully splashing in the pool. Additionally, while we try to not disrupt the rest of your yard, installing a pool can do some damage to the surrounding landscape. If you install in spring, we can replant grass and spruce up your landscape design during a time of year that is optimal for installing plant life, giving you not just a beautiful custom pool but a custom landscape to go with it. However, if you are choosing to go with a custom swimming pool and spa design, then installing in any season works as you can certainly enjoy your new custom hot tub even during the winter. Consider Safety: This is especially important if you have young children. In the past, simple fencing has been a popular safety option for many pool owners, though, unfortunately, this isn’t always aesthetically pleasing. If you choose to go with fencing, Ivy Studio can include a safety fence around your pool in the design process so excited kids or grandkids don’t accidentally fall in. Thanks to new technology, though, another option that a lot of pool owners are moving toward are electronic sensors that are small and discreet and can set off an alarm when someone or something enters the water. After considering the logistics of a pool install, you can start thinking about what many homeowners deem to be the “fun part” of custom swimming pool design, which are preferential aspects like size, shape, and special features. Is your pool going to be used for the kids or grandkids to play in or for you to swim laps in every morning? Do you want a place to retreat from the “real world” and relax for a bit or a high-tech environment with a full entertainment system? Do you need a shallow kiddie pool section or strategic grab rails for more stability? These are all important questions to determine before beginning the design. Your pool designer will work with you to help determine what the pool will be used for and who will be using it in order to give you a pool that you can enjoy for years and years. Freeform: A freeform pool is exactly what it sounds like. It is asymmetrical and often follows the curvature of the landscape. Rectangle: This is the most popular shape for traditional swimming pools and with the right design elements can look unique and luxurious. Roman or Grecian: These are both spins on the traditional rectangle. They typically have long, straight edges with rounded cutouts on the corners or along the short edges. Geometric: Geometric pools will have familiar shapes like squares and rectangles combined in various ways. For example, an ‘L’ shaped pool could be considered a geometric pool shape. When going with any sort of unusually shaped or large pool, gunite is going to be the best building material. Gunite is a special type of concrete used in pool building that allows for any shape and size of pool to be created as the pool is built on-site, rather than off-site and trucked in like fiberglass pools. Gunite is incredibly durable and built to last and can be finished with plaster, tile, decorative rocks, you name it. Custom gunite pools are built by digging out the ground slightly larger than you want your finished pool to be and building a rebar framework. Then, the gunite mixture is sprayed onto the rebar and allowed to cure. If you are going with a luxury pool and spa design for your home as opposed to a store-bought, pre-made pool, then a custom gunite pool is the best option. What Style Or Atmosphere Do You Want To Have? Custom Modern Pool Design: Modern pools have sleek, clean edges and often utilize elements like smooth concrete and slate pavers, shallow tanning decks, and sometimes have an attached hot tub that beautifully flows into the pool. Resort Style Pool: No one said you have to go to Cabo to enjoy a resort pool. You can bring the relaxation of a resort to your backyard by including elements like waterslides, fountains or waterfalls, a swim-up bar, a sloped “beach” entry, and even a cozy custom pergola. Natural Pool Style: Natural pools are perfect for those who want a relaxing, nature-inspired pool in their backyard. A natural style pool is often freeform in shape and and surrounded by boulderscaping, rock waterfalls, natural stone paving or wood decking, and plenty of organic plantlife. Sometimes you want to go above and beyond just a really great pool – sometimes you want to add a touch of luxury and create an outdoor area that is truly a marvel. Keep reading to get some ideas about what Ivy Studio can incorporate in your custom pool to take it to the next level. While an outdoor pool is great, an indoor pool might be better suited for year-round use, especially here in Newton. We can design and build indoor pools and spas for residents of Middlesex County and the surrounding areas, and even add some neat innovative features. 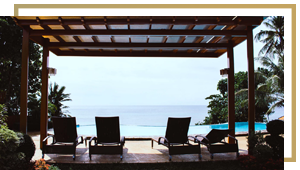 For example, we can create an entertainment system near the pool so you can watch movies or stream games from the spa, or create an indoor-to-outdoor environment that is semi-covered or openable during the summer. We’ve briefly touched on this, but it is important to remember that your hot tub or spa can be incorporated right into your pool. There are a lot of ways to do this, so be sure to ask your pool designer about ways to do this. This allows for you to hop right from the pool to the spa without ever walking around in the cold and vice versa. This is an increasingly popular option of pool design and are also called “vanishing edge pools.” Essentially, one or more edges of the pool will actually be overflowing with water, giving the illusion that there is no edge to the pool. But don’t worry, this won’t flood your yard. The water overflows into a trough-type device that collects the water and pumps it back into the pool. Infinity pools are the height of luxury and often only seen at the most expensive resorts. However, Ivy Studio can create this feature in your own backyard. Pools can incorporate fire pieces, which add an element of elegance to any backyard. This can be anything from incorporating a sleek gas fire pit on the edge of the pool to lining the pool with gas torches. Talk to your pool designer about options for incorporating fire features into your custom pool design at your initial consultation. Landscape lighting around the pool as well as underwater lighting help to keep a pool safe in addition to creating a resort-style feel. There are lots of options for pool lighting, from traditional round, yellow lights like you see at your local swimming pool to fun, multi-colored LED lights. Ready To Start Your Newton Custom Swimming Pool Design? We’re here to help! 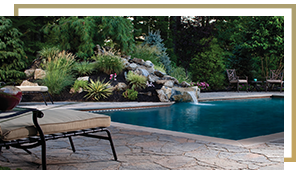 We are experienced pool builders in Boston who specialize in creating luxurious outdoor living spaces. We serve the greater Boston area and would love to get in touch to schedule your free pool design consultation. Our design and build process always starts with scheduling an on-site survey where you can meet with an expert pool contractor and start throwing ideas around. Then, we’ll throw together a few 3D renderings for you to look at and tweak your favorite design until it’s exactly what you are looking for. After that, we’ll draw up the final plans and break ground. Before you know it, you and your family will be enjoying the luxury of having a beautifully designed pool in your backyard. Get in touch today to start your custom swimming pool design and installation!